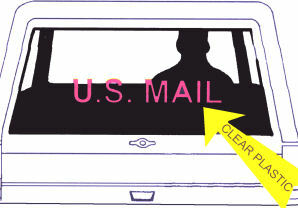 Static Sign - Rural Carrier U.S.Mail (8"x24") .012 mil indestructible plastic U.S. Mail Signs that will adhere by static cling to the inside of your rear window. This is the answer for vehicles with non-magnetic rear panels or where there is not enough space to place a sign. They are highly visible to following motorists and can be installed and removed daily. In bright Fluorescent Orange lettering. This is a static cling, non-magnetic sign.